To say today’s brands are in unchartered waters is an understatement. But with the right plan, the bravest ones can push forward with power. A wave of uncertainty is sweeping the globe. Every minute brings a new headline (or tweet) that forces individuals to take sides on an issue, making an already-polarized world more fractured and tribal. In an “us versus them” culture, many consumers have taken on an activist sentiment, impacting businesses’ bottom lines by voting daily with their wallets. In this climate, it leaves brands wondering when, how and why they should engage. There are some cases where consumer brands aren’t exactly given a choice. Reluctantly thrust into the national spotlight, many brands are ducking and weaving boycotts left and right. On the contrary, other brands are finding the need to proactively appeal to the activist consumer sentiment. Although it’s necessary for brands to find their voice in politically charged times, taking a stand just to take a stand—likely on an issue irrelevant to their business or consumers—can come off as inauthentic, overly cautious and, worst of all, opportunistic. Take Audi, the luxury-car brand, for example. Recently, the auto retailer caught flak for running an ad during the Super Bowl that focused on the gender pay gap—even though their entire corporate management team is comprised of men. Audi positions itself as a progressive brand, already taking steps to promote gender equality at all levels within their organization, but the results remain to be seen. It’s not wrong for Audi to have a point of view on this topic, but the statement doesn’t relate to their product and consumer base—and it doesn’t currently reflect in their own operations. Much like if Warby Parker championed reproductive rights, or Bath and Body Works focused on college-loan forgiveness, the proposition feels disconnected. Taking a stand just to take a stand … can come off as inauthentic, overly cautious and, worst of all, opportunist. But when a brand walks the talk, it can have a ripple effect across the world. Amidst the global Syrian Refugee Crisis, the US administration revealed its controversial immigration ban, negatively affecting many employees of Lyft, a transportation network rivaling Uber. Almost immediately, Lyft publicly acknowledged and defended their company values, donating $1,000,000 to a non-profit organization that actively works within a similar moral framework as Lyft’s. Could it have cost them big? There’s always that possibility. 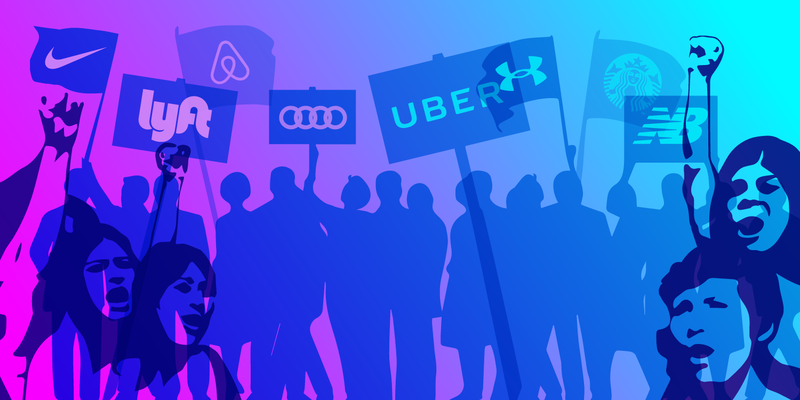 But by authentically living out their core ideology in defense of their consumers and employees and taking what may seem to be a business risk, Lyft won big: within days, the ride-share app saw greater downloads than Uber for the first time ever. A brand promise describes why your brand exists, and it should be the single-most powerful and motivating idea behind your brand. This established foundation connects a business to its consumers in a way that matters. It’s a compass that will point to the brand’s true north, especially when faced with tough decisions that carry serious implications. When a certain issue—controversial or not—impacts your business or consumer, there’s a clear opportunity for your brand to stand up for what it believes in. Take note: not engaging at all makes just as much of a statement as if you do. There can be an overwhelming fear of failure or alienation, but extraordinary brands have the courage to be true to who they really are. While doing so, brands need to make sure they do something that actually makes a difference. Consumers are savvy enough to spot slacktivist brands—the ones that can’t back up what they preach. to survive—it emboldens the brand to win.